"She has no indication of when she will leave ... they are not telling her why she cannot leave,” said Ullah, who fled Pakistan Friday following threats from extremists who were angry about his longtime assistance to Bibi. Bibi’s plight started approximately 10 years ago when two fellow field workers accused her of drinking from the same container as them and refused to drink after her because she is a Christian. Ullah said that Bibi told her that her security detail will not tell her why she is still hidden away. "In recent months, he has been physically assaulted, gunmen have opened fire on his home, and several religious radicals attacked his home. Ullah said he fears being attacked again or charged with blasphemy," the AP reported. Bibi's daughters live in Canada where Bibi has been granted asylum and is hoping to join them. “After nine years behind bars for a crime she didn’t commit, it is difficult to see this long overdue verdict as justice. But she should now be free to reunite with her family and seek safety in a country of her choice,” he said. 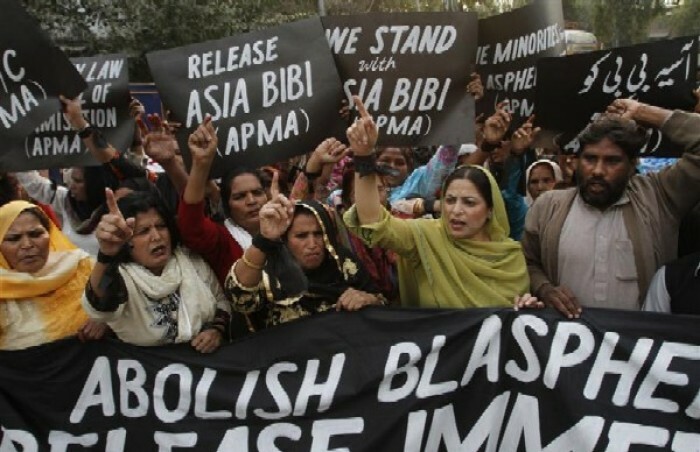 Mohydin and other human rights activists have repeatedly called for the Pakistani government to scrap their blasphemy laws as soon as possible, in addition to any other policies that discriminate against and endanger religious minorities.